I've recently completed my first build, and like everything it wasn't/isn't enough..
With that said i've already begun working on v.2 of the build and have come across what may be an issue, if any thing other than ambient noise. 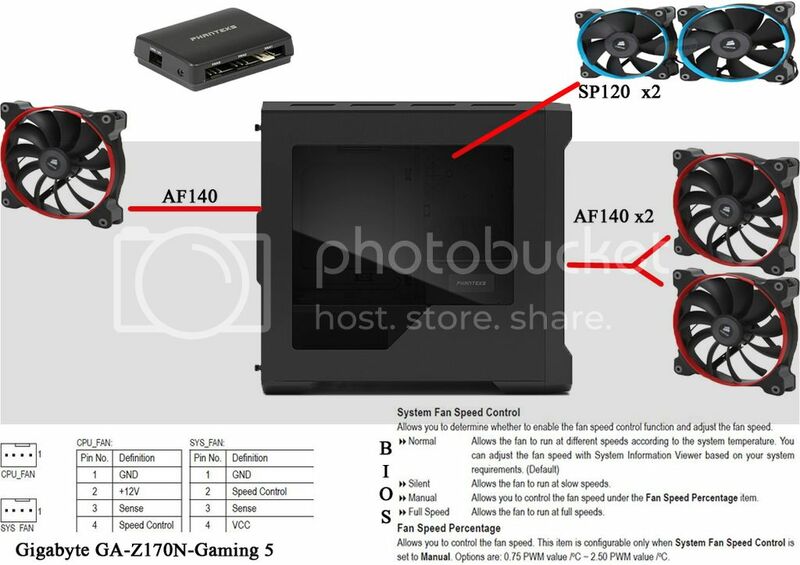 I want to run the other five fans on the sys_fan header by way of the phanteks fan hub (or other variant), but am concerned with the pinout showing that pin number four is vcc, thus possibly running the fans at 100% 100% of the time. Does anyone know if that will be the case here, or should I still see speed control by the mobo? I'm just going for it - i'll post back my findings, as i'm sure it will help someone else in the future. Sorry to be blunt, but it seems you are going into this with little to no knowledge of what you are doing .. giving very little detail of what you want to do. While the stock PH-F200SP fan is not great, changing to AF-140 fans is not what most of us would consider a smart move. They may look nice, but they do not perform very well. They will move enough air to meet your needs. The reasons are many, but simply put, they do not have the airflow and pressure ratings needed to overcome the resistance of case venting and filters .. nor will they move enough air through a CLC radiator. CLC radiators are very restrictive and require very high flow / high pressure rated fans. This is the reason all CLCs are noisy. 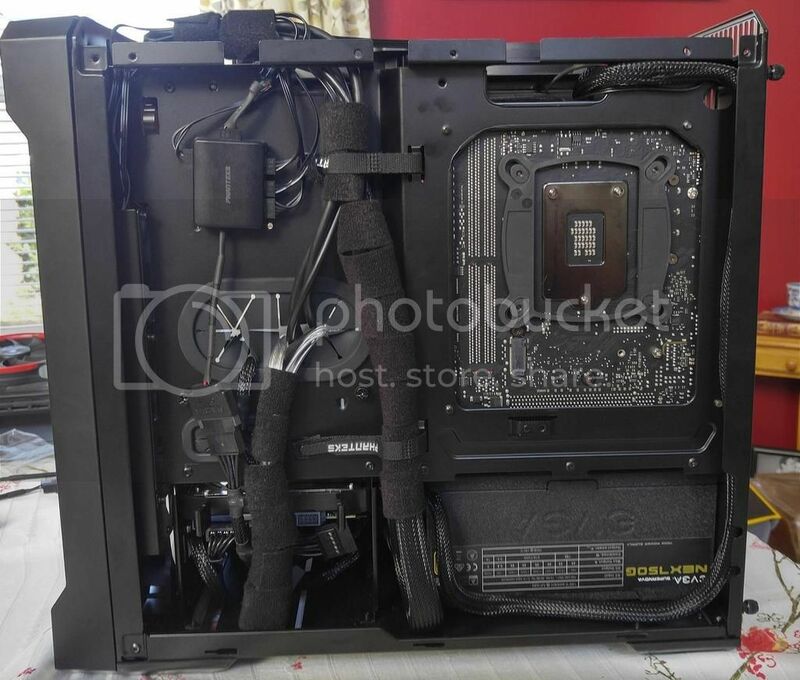 Honestly, the Evolv ITX is not designed to flow enough air for a 140mm radiator and a 240mm radiator without using one as intake and other as exhaust. 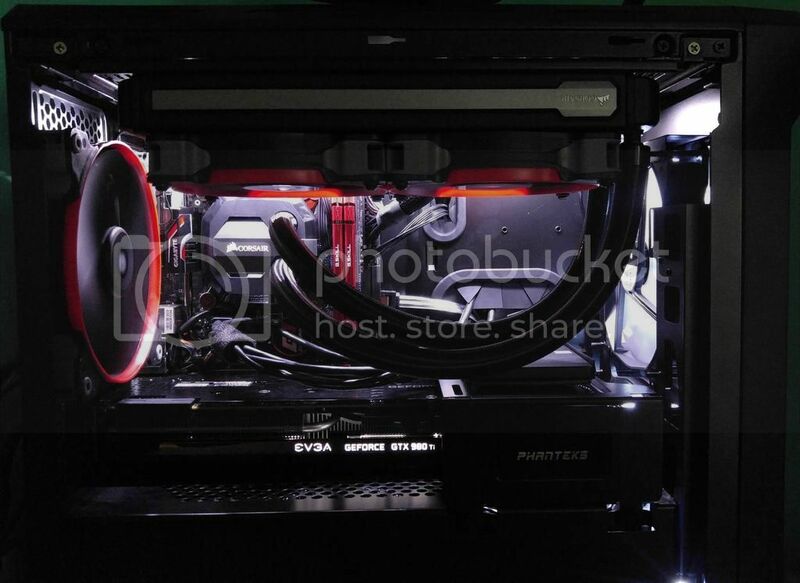 Both the front and top of case have limited venting .. and this limits the airflow. Measure the open area in the vents, total that area and compare it to the area of the fans these vents supply. The airflow area of a 120mm fan is about 100 sq cm. A 140mm fan has about 140 sq cm airflow area. Your SYS_FAN header VCC on pin-4 means pin is doing nothing. It is a variable voltage header and is only using the pins. 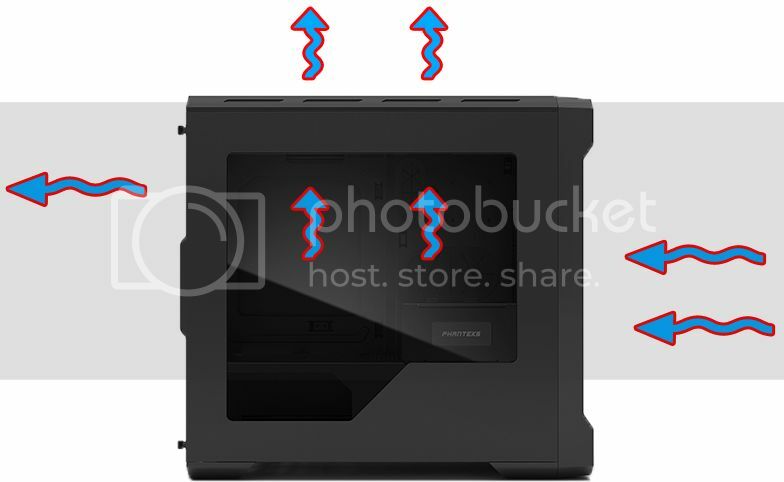 Phanteks PWM fan hub IS NOT A PWM FAN HUB The name has miss-lead many people to think it is. It is a PWM controlled hub for 3-pin variable voltage fans. It uses the PWM signal to control the 12v power from PSU to 3-pin fans .. and this controls the fan speed. Perhaps - this is a continuation of my first build, and I have given quite a bit of thought into this, which is why i've included the details that are present.. 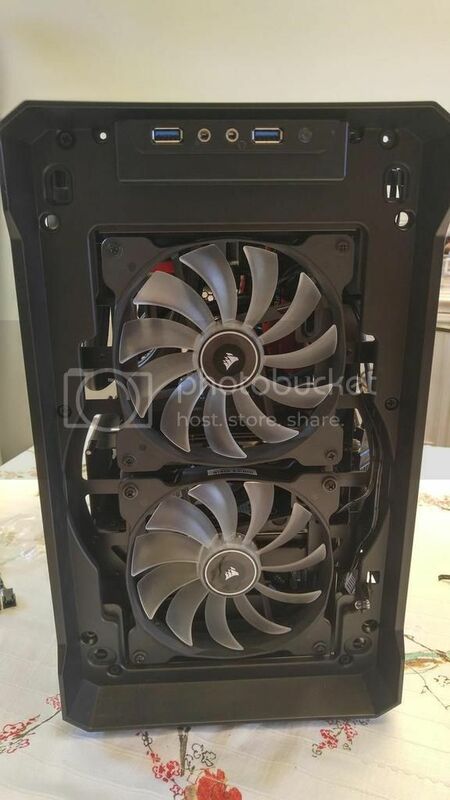 While the stock PH-F200SP fan is not great, changing to AF-140 fans is not what most of us would consider a smart move. They may look nice, but they do not perform very well. They will move enough air to meet your needs. The reasons are many, but simply put, they do not have the airflow and pressure ratings needed to overcome the resistance of case venting and filters ..
High Static Pressure units won't have a problem and flow more combined. nor will they move enough air through a CLC radiator. CLC radiators are very restrictive and require very high flow / high pressure rated fans. This is the reason all CLCs are noisy. I am using high pressure rated 120s on the bottom of the raditator. This makes sense, and I did take this into consideration when looking at how to improve airflow. Worst case I go back to the PH-F200SP if the 2 140's don't perform as needed. However, the two 140's have a higher combined sp rating. Thank you for clearing that up - i've seen other people use it but have gotten zero response from any inquires. That is what I see in my head when working this out - is that flawed, other than the potential for the front intake fans not pulling enough? I should note, as I haven't previously said this, that I am cutting the top of the case and mounting two 120s over the top of the radiator in a push/pull configuration with the two below. Last edited by rfeni; 03-16-2016 at 05:12 AM. I'm sorry, but you are acting like you know much that is obviously not known. I'll not argue with you about what is or isn't going to work. I have years of education and experience working with airflow and air cooling backing my statements. Not to sound pompous, but I'm the professor and you are the first year student. The difference is I spend hours every day giving guidance to others. If someone doesn't want to listen and learn, there are almost always others waiting for my replies. You answered my post 3 hours ago. I've just now reached your reply in the queue. Your posted image is AF140 fans, and they are not a fan classified as 'high pressure'. Stop and think about how much resistance to airflow the limited vent area in the case, the grills, filters and other obstructions create. Combine that with not wanting to run the fans at full speed to keep noise levels reasonable, and you will begin to understand why many of us with years of experience use 'high pressure' fans for everything. As much as I love Phanteks products they are not infallible. The PH-F200SP is a bad fan. I've tried them. I've tested them. So have many others. The universal response from everyone who knows fans, is they are not good. For all general applications, the static pressure rating of one fan will not increase by 'combining'it with another. To do this they have to be stacked, rotate in different directions, etc.. You are doing none of these things. They will be mountede side by side, making it impossible for one to boost the pressure into the other. Side by side they have the potential of flowing more cfm. But the fans you have chosen are not going to be able to overcome the case restrictions. It is and it isn't. You have 1x 140mm exhaust with a low resistance grill and 2x 120mm with radiator and top vent restrictions. But you have only 2x 140mm intakes with very limited vent area, filter resistance and additional case resistance. More exhaust fan potential with less intake fan potential. The maximum the case will flow is what comes in the front. Case can only flow the smaller of the two, intake or exhaust, because once they equalize their flow that is what it is. What flows out of case must first flow into case .. or .. what flows into case must be able to flow out of case. You are building a very expensive and very noisy system. 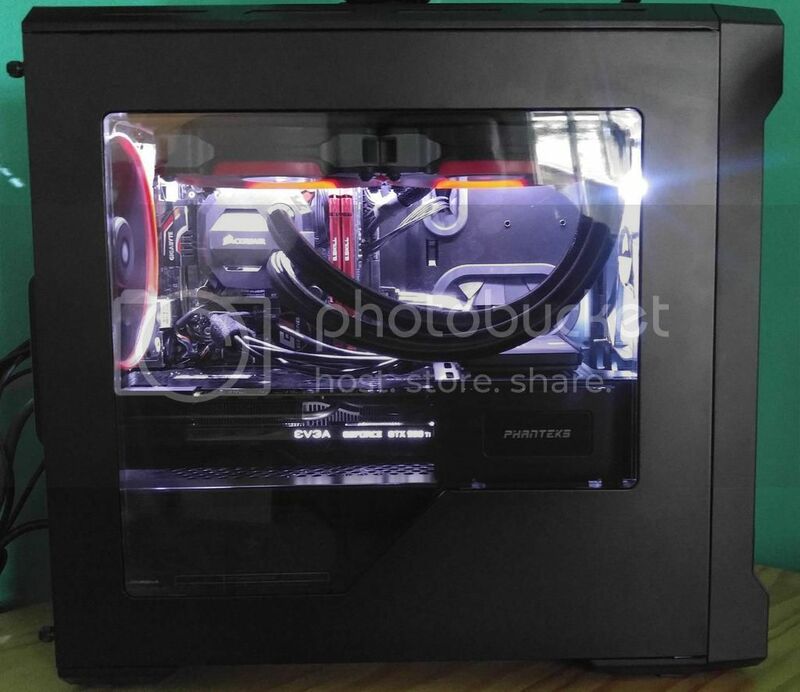 I would advise something like a Swiftech H220 X2 with an additional radiator and water block for GPU. Better performance, much better products and quality, and not much different in cost than 2x CLCs that are marginal at doing the job they sell for. 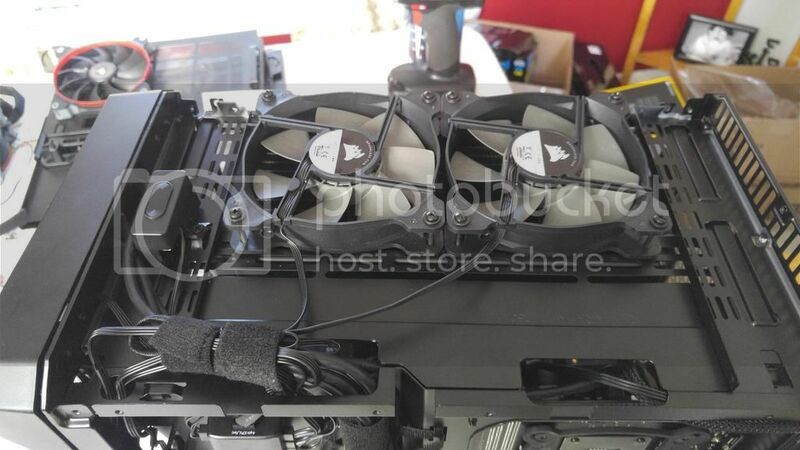 This is another of the knowns of people who have years of experience in using air coolers, custom loops and have tried CLCs; CLCs are as close to junk as they can be and still work. 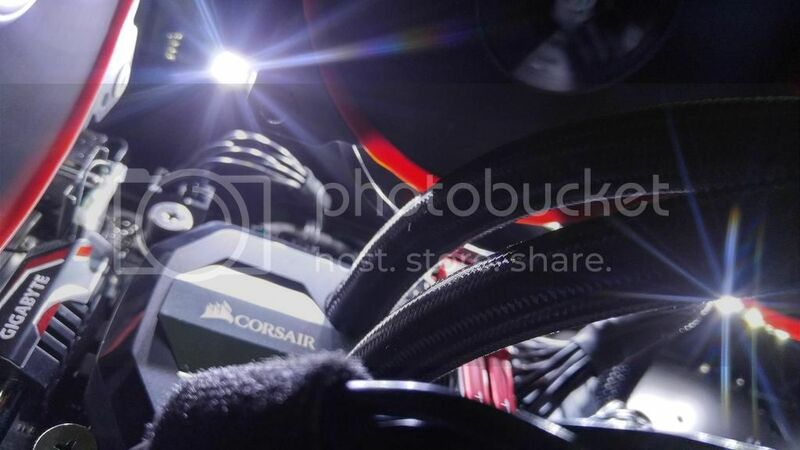 During the update of my build I was planning on cutting the lid of the case and having two high static pressure units mounted on top of the radiator in a "pull" setup. However, during my smoke test I only mounted the SP120Ls that came with the CLC and after being assaulted with the turbine sounds I decided to forgo the pull fans and see how temps were as it was. It is very important to understand that the Phanteks hub is not what the part description leads you to believe; it's merely a controller for 3 pin fans, as stated by doyll above. What is also important is understanding your motherboards pin outs and capabilities. With my particular motherboard I am able to control the 3 fans connected to the hub by establishing a curve based on workload and temperature, which is reported by the motherboard. If your board does not support controlling the sys_fan pin then you likely will be in a situation where your fans are running 100% at all times. 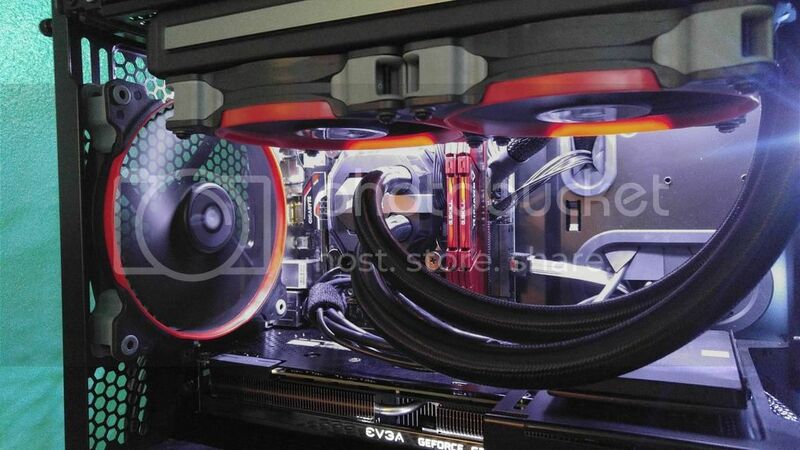 Now, if you chose the correct fans, this may not be an issue, but will of course affect the longevity of the units. Even at 100% this setup is very quiet, but I rather have a predefined curve than have an active wind tunnel on my desk! Haha. As of right now I have great temps reported by the motherboard as well as an external thermometer. 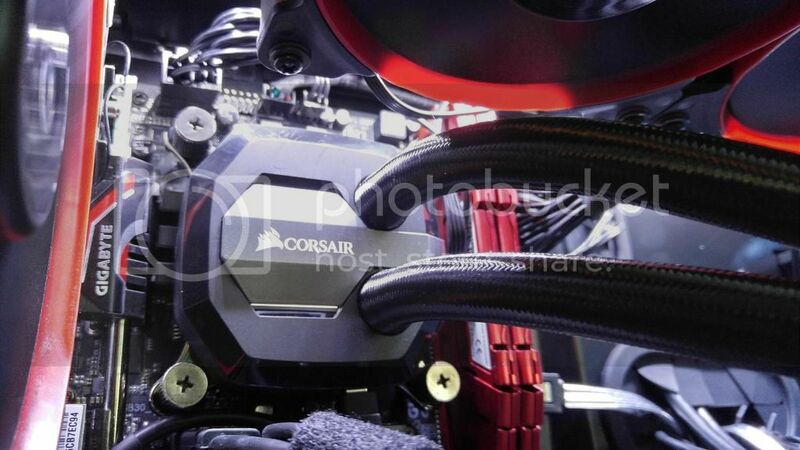 With that said, I may still switch the two intake fans to high static pressure specific units. I would like to add that many motherboard only have PWM control on the CPU fan header. Using this PWM fan header to control cases fans usually works very well. The only potential problem is if CPU idles when video card work .. means case fan do not speed up to supply more air to GPU. is a self-professed security expert; he has been making the people aware of the security threats. His passion is to write about Cyber security, cryptography, malware, social engineering, internet and new media.